The Bears likely will be without cornerback Nathan Vasher this Sunday against the Lions in Detroit, as the former Pro-Bowler underwent a surgical procedure on his right hand. The Chicago Sun-Times reported the story in today’s edition. The paper says that Corey Graham should step in for Vasher if he doesn’t play. Last season Vasher missed 12 games with a torn groin muscle. Other Injury News: As expected, starting cornerbacks Charles Tillman (shoulder) and Nathan Vasher (hand), along with Tommie Harris (knee) and Brandon Lloyd (left knee sprain) did not practice. 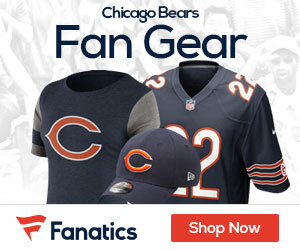 Charles Tillman is planning to play and Brandon Lloyd has not been ruled out yet. Corey Graham, the starter slated to replace Vasher, who draws comparisons to Tillman had this to say: ‘I feel pretty good,” ”The more you get an opportunity to go against the [starters] and play in games, you get more comfortable and more confidence in yourself. I feel like I can make plays and do the things that I need to do. I like going against bigger receivers. It’s a little easier for me, being a big corner.” Graham undoubtedly will have a tall task ahead covering either Calvin Johnson (6-5) or the often spoken, much noted Roy Williams (6-3). Closing Conclusion: My thoughts on the critical injuries after reading the quotes have led me to believe that Lloyd will try to give it a go, yet ultimately sitting out, thus completely ready for Week Six in Atlanta. This injury clearly is not serious and means Earl Bennett will get his first shot to play and I know he can make an immediate impact. I also would like to see 6-foot 3 Brandon Rideau elevated from the practice squad to receive some playing time against a shaky Detroit back seven – his height presents match-up problems, thus being a difficult guard for any Lion defensive back. As for Tommie Harris, you have to think he will play after missing last week’s game against Philly, even though Dusty, Israel, and Marcus Harrison filled in admirably. I know he is totally frustrated not being able to play, just like any Bears fan. With Charles Tillman and Nathan Vasher, I’ve realized Tillman will tough it out and play through pain like he usually does (missed only one game in ’07), while Vasher on the other hand, will sit out because of a serious hand. As long as the team has one of the starter’s out there, they will be fine with Corey Graham, who is an above-average fill-in, to make his 1st NFL start and make a contribution along with Danieal Manning and Trumaine McBride – maybe talented 5th round rookie Zack Bowman or recently acquired Marcus Hamilton (Bucs) suits up for a first appearance as a Bear, having their presence felt against a pass-happy Detroit aerial attack. With all options taken into consideration, you have to think that the Bears are feeling a bit of deja vu once again with Charles Tillman and Nathan Vasher hurt. They can cope with Vasher out and Tillman in with Graham, Manning, and McBride all seeing increased time. I expect Tillman to play, but if he doesn’t – it could be “upset city” in the Motor City. Two back-ups facing Johnson/Williams equals a “vanilla” Tampa-Cover 2 defense. That bland defensive scheme does not bode well for Bob Babich’s unit, which is at its best when extremely aggressive and attacking at the LOS. This does not translate well with the pass rush, or lack thereof, generated from the front four. The DL is doing its part and rightfully so, performing a great job stopping the run, but without a healthy Tommie Harris, trouble has occurred getting to the QB and this leaves the corners in a tough situation – a situation in where the Bears cannot be in if they want to leave the Motor City, 3-2. What I Think About This Pivotal Match-Up: With a victory, the team would be atop the weak and winnable NFC North and another week closer to its Week 8 bye – to get healthier, receive more rest. With the pass coverage expected to suffer a drop in production due to injuries, coupled with a poor pass rush and less than stellar (adequate) group of inexperienced pass catchers (Booker, Clark step up) leading the way as targets for the inconsistent Kyle Orton, it can be and has to be said that the offensive line and running game will have to carry the work load and shoulder the burden in the upcoming weeks, more than ever. Thankfully for the Bears, they have three winnable games next on the schedule (Sunday @ Det, @ Atl, home vs. Minnesota) and this injury bug could not have come at a better time, and what a great opportunity it is for the defense to show it’s true colors and get back into full stride and turnover mode they’re capable of, forcing the opposition to give up the ball, putting the offense in an opportunity to cash in on excellent field position – where the offense needs to thrive, take advantage, and finish games. Which Bears defense will show up? The ’04-06 version which has at times resembled the ’08 product or the injury-riddled and plagued ’07 version? The unit which finished off Indy and Philly, or let Carolina and Tampa off the hook? Which Bears offense will arrive in Detroit? The offense which ran all over Indy and played the 2nd half against Tampa and 1st half against Philly? Or the group which could not do anything in the 2nd halves against Carolina and Philly? All I can say is this, good teams win the games they’re supposed to and the Bears have three upcoming games they will be favored in and supposed to win. 5-2 is within reach if the defense and special teams reaches out to provide good field position and the offense reaches in for their best concentrated effort to hold on to the ball and run the clock out, making just enough plays to support an ailing defense. First things first, a victory is needed Sunday afternoon at Ford Field against a winless and Matt Millen-less Lions squad, which is rested coming off a bye and hungry and confident for a win. The Bears will be able to secure a win if they come out firing and clicking on all cylinders, starting off strong and hitting Detroit right in the mouth, to show who’s black ‘n blue and who wants a win more. We have to come out the gates and on to the field ready and focused, looking more like a team that knows they are supposed to and going to win, rather than that of a team that is just happy to be at .500 and wanting to win, yet not really knowing they should. 3-2 or 2-3 is a big difference, especially since its a division game, and the outcome hinges on the Bears ability to give Matt Forte and Devin Hester, their playmakers on offense, the opportunity to have the ball in their hands to make plays and make an impact, being the difference-makers they are. Of course, this all depends if the offensive and defensive line win the battle in the trenches, protecting the QB and getting to the QB, while controlling the LOS and doing what good teams should do – outmuscle the opposition and make it known from the first play they came to win and come out on top in the grueling fight up-front. The more they keep Detroit in the game, the more chances they have to take this game away from and the longer they have an opportunity to beat the better team, with the higher expectations.